Redmi Go Android Go Smartphone Launched in India at Rs. 4,499 | Specifications. 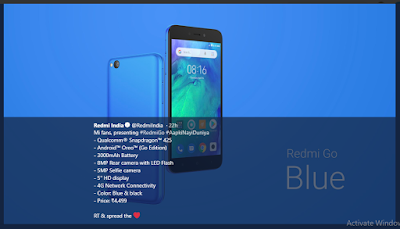 Home » Mobile » Tech News » Redmi Go Android Go Smartphone Launched in India at Rs. 4,499 | Specifications. Redmi Go, the most affordable smartphone from Xiaomi has been launched in India at an event in New Delhi on Tuesday. The first look of this phone was unveiled by Xiaomi in late January before being launched in the Philippines. There are so many outstanding features available in this new Redmi Go like, HD display, support for unlimited Google Photos storage, large 3,000mAh battery as well as external microSD card slot. The company is likewise touting help for more than 20 Indian languages, just as Google Assistant Hindi help (just as Hinglish) in the cell phone. Peruse on for more insights regarding the Redmi Go cost in India, dispatch offers, discharge date, and details. 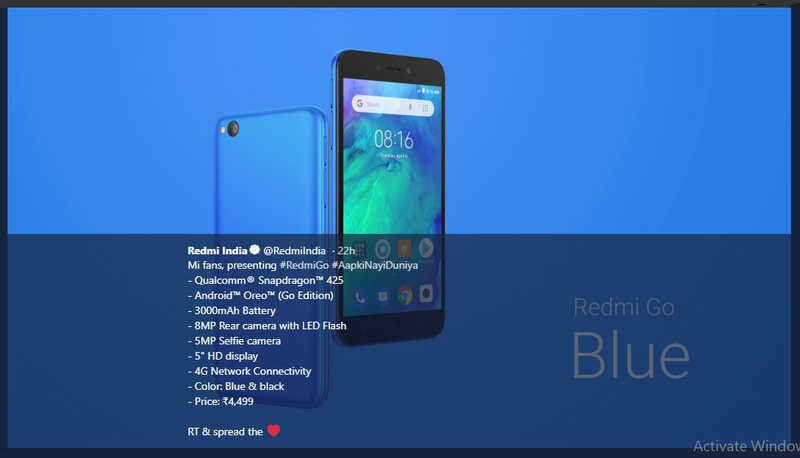 Redmi Go price in India and release date. The price for Redmi Go in India is Rs 4,499 for the 1GB RAM and 8GB inbuilt storage variant. The another model which consist 1GB RAM and 16GB inbuilt storage variant is not released in the country. This phone will be available in two different color Black and Blue. 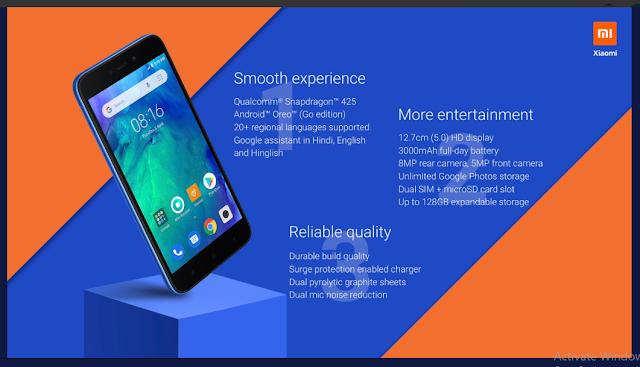 This phone will be available on Flipkart, Mi.com and Mi Home store from 12pm (Noon) IST on March 22. Redmi Go is also going to offer Rs 2,200 Jio cashback and 100GB free data, revealed by Xiaomi. Redmi Go Camera and other Specification. >>Runs of Android 8.1 Oreo. >>It has a 5-inch HD (720X1280 pixels) display. >>It is powered by quad-core Qualcomm Snapdragon 425 SoC. >>1GB RAM and Adreno 308 GPU. >> Features with 8-megapixel rear camera with 1.12-micron pixels. >>It consist of an f/2.0 aperture and a single LED flash module. >>The phone also support full-HD video recording, apart from HDR features, and smart scene detection. >>It has 5-megapixel front camera. >> 8GB inbuilt storage and expandable up to 128GB via microSD card. >>Unlimited storage on Google Photos in high-quality resolution. >> Connectivity: 4G VoLTE, Wi-Fi 802.11 b/g/n, Bluetooth v4.1, GPS/A-GPS, 3.5mm headphone jack. >>Available sensors include an accelerometer, ambient light sensor, proximity sensor. >>Measure 140.4x70.1x8.35mm and weight 137 grams. >>It runs on 3,000mAh battery that provides a standby time of 10 days.